As your go to Chimney expert in St. Louis and St. Charles, We take pride in our service, and with 10+ years of experience of chimney sweeping in St. Louis we have socked enough soot to understand what it takes to have provide safe and clean chimney sweep. And at most people’s surprise, we do not have to get on the roof in most cases. Our Service- As we pull up to the job we try to get a visual on the chimney stack from the outside. This is just to make sure there is nothing blocking the top of the flu and that the flu is capped. Once that visual is made we proceed inside. Once inside, We place a 9 x 12 heavy canvas tarp across your fireplaces hearth. From there we bring in a high powered vacuum, and our other tools. We start by sweeping your flue from the damper to the top. With the hose from the high powered vacuum inside the firebox we can control all falling dust and soot keeping your home with no mess. Once we have the flue swept from all soot and creosote, we clean out the firebox removing all and any soot and creosote from there as well. After we have swept your chimney and firebox, we proceed with a level 1 inspection to make sure your chimney flu and fire box are in well working order as well as being safe to use. 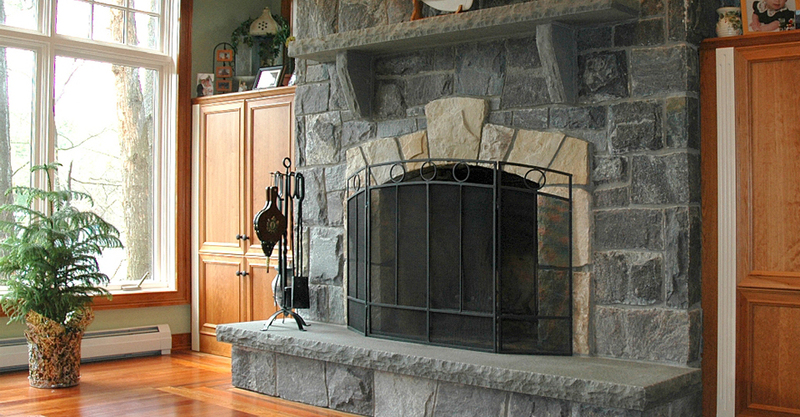 With every fireplace in St. Louis or St. Charles chimney sweeping and maintenance is very important to the safety of your home and family.